Didn’t manage to get to this one, but it sounds a fantastic day. 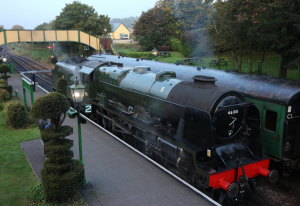 The Watercress Line’s Autumn Steam Gala 2016 was an excellent three days for those who love to see a lot of steam engines in action. There were three visitors to the railway, with the headliner being 46100 Royal Scot on its first visit to the line. It was joined by the only surviving Ivatt 4MT, no. 43106 from the Severn Valley Railway and ex-S&DJR 7F 53809. Unfortunately the latter failed and was unable to perform, but sat in the yard in Ropley where visitors could get up close and even explore the cab.